1. Get to the shops. Now! Total Guitar is available in all good newsagents and supermarkets. If you're not sure where that is, then click here, select Total Guitar, tap in your postcode and you'll be able to hunt down your nearest stockist. If you can't make it to a retailer, you can order our latest issue - plus back issues - online here. It'll be hastily put in an envelope and delivered through your letterbox in no time. You can order from overseas too! 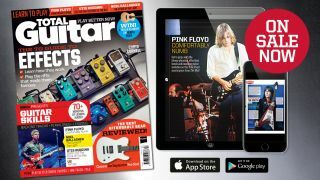 Total Guitar isn't just a print magazine, it's available for your smartphone, tablet and PC /Mac too! What's more, it's available worldwide for you to download this very minute. Android users can get it through Google Play here, and this edition also works on PC and Mac (you'll need Chrome installed). iOS users can download the app here. We're so generous, that you can even get the latest issue free by starting a 30-day trial!